Every once in awhile, we see a story that is just so neat – we have to share it (even though it’s not necessarily something that happened in Juniata County). This is one of those instances. As the “marryin’ season” is now upon us, this seems the perfect time to share this story! If you have a similar story, especially if in Juniata County, please share it! Reprinted with permission from Diakon Lutheran Social Ministries (from their recent Spring Newsletter: Dialog), this story was written by Tracie Spence. Marriage proposals are made in a variety of ways. There’s the traditional proposal where the man gets down on one knee and asks for the woman’s hand in marriage. There are also the more modern proposals of airplanes pulling a banner with the message, “Will you marry me?” to popping the question on an electronic sign at a sporting event. But the late Major Claude Hensinger had his own, unique way of proposing to his girlfriend, Ruth. Hensinger was returning from a bombing raid over Japan in 1944 when his B-29 was shot down over China and he was forced to bail out of his plane. Fortunately, his injuries were minimal, and he survived the night using his parachute as a blanket. Shortly after returning to the U.S., Hensinger began dating Ruth, whom he had known since childhood. After a year of courting, Hensinger proposed to Ruth by giving her an unusual gift—his parachute. “He said, ‘This is the parachute that saved my life. 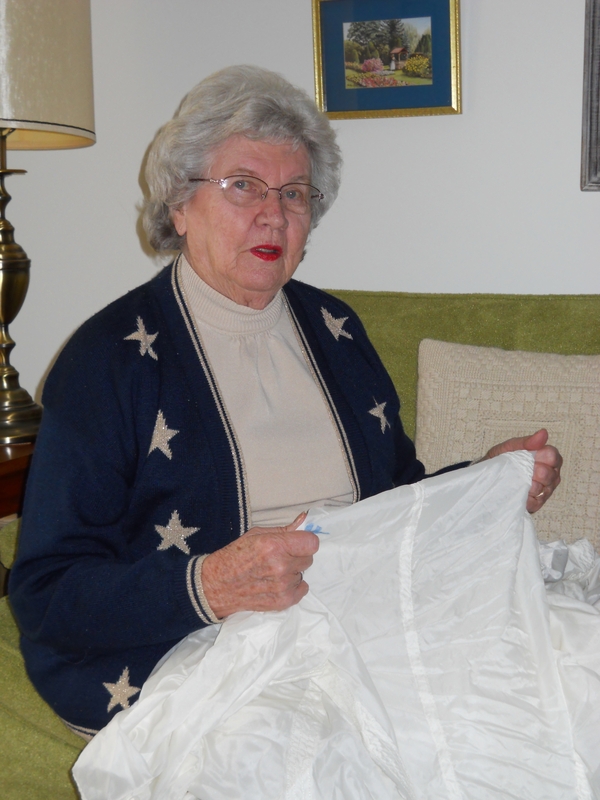 I want you to make a wedding gown out of it,’” says Ruth, a resident of Luther Crest, a Diakon Lutheran Senior Living Community in Allentown, Pa.
Ruth was overwhelmed by the parachute’s massive size. “I thought to myself, ‘How am I going to make a gown out of 16 gores of nylon and all that bias?’” she says. Her inspiration came from a dress she saw in a store window; the dress was based on a gown from Gone with the Wind. Hensinger made the skirt herself by pulling up the strings on the parachute so that the dress would be shorter in the front and have a longer train in the back; she then hired a local seamstress to make the bodice and veil. In the early 1990s, Hensinger learned the Smithsonian Institution was looking for artifacts made from World War II-era parachutes. 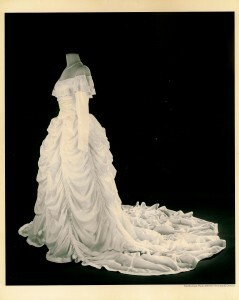 She contacted a curator, who requested that she send the gown and veil to the museum. Hensinger sent it without a second thought. “What was I going to do with it? I don’t have granddaughters to wear it,” she explains. The museum has since displayed the gown at a number of exhibits, including most recently at the Air and Space Museum in Washington, D.C. I loved this story. Thank you for sharing. Making a wedding gown out of the parachute that saved her husband was so very touching. The dress is beautiful. This story was wonderful. I was searching the internet because my Dad was a paratrooper in World War II. He passed away a few years ago and I have been going through all of his belongings. He still has his original parachute. He would take it for display at several 101st Airborne reunions. I am wondering if the Smithsonian would be interested in that also. Would you happen to know. I’m not sure about the Smithsonian, but if your father was from Juniata County, we’d be happy to consider it for our Academy Museum!